The International Energy Agency (IEA) has recently released a special report on India’s energy outlook that maps out both the constraints and challenges that the country faces. According to the IEA, India is already the single largest contributor – about 25% – to growth in energy demand globally. As India hosts 18% of the global population, and accounts for only 6% of global energy use, the IEA estimates that the growth in demand will continue. 3) the Indian government has committed itself to expand manufacturing growth through initiatives such as the “Make in India” campaign, which will require massive growth in energy supplies to be successful. The report, focusing on growth until 2040, estimated that the European Union, US and Japan would see negative growth in energy demand as the populations aged, and energy use was cut back. Growth was predicted in Latin America, the Middle East and Africa, with China’s demands growing faster still. India would still be the leader in energy growth, much of it carbon based. 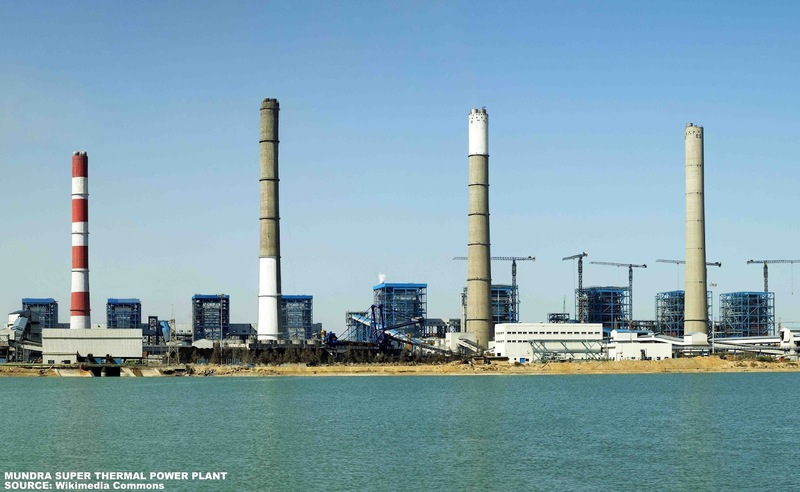 Dr Fatih Birol, the IEA Executive Director, said that the IEA estimated that by 2040 India will triple coal production while also increasing imports. The great bright spot was the expansion of renewable energy. 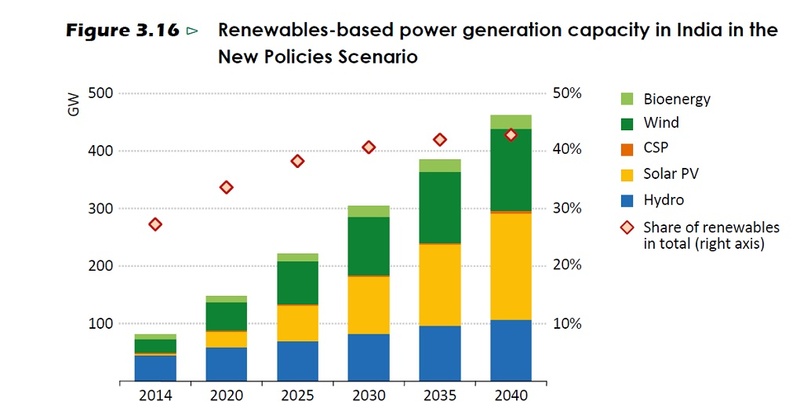 The IEA envisages a massive expansion of installed capacity based on renewable energy, going from less than 100 GW in 2014, to more than 450 GW in 2040. The IEA projections clash slightly with those of India in its Intended Nationally Determined Contribution (INDC), as the IEA projects that India will only be able to build an installed capacity of 150 GW from renewables by 2020, which makes it difficult to believe that India would achieve a 175 GW installed capacity by 2022 as it has promised in its INDC. Nevertheless by 2030, the IEA estimates that India will derive more than 40% of its energy through renewable energy, exactly in line with the INDC. Strict policies to control and deal with the levels of pollution will be a must. 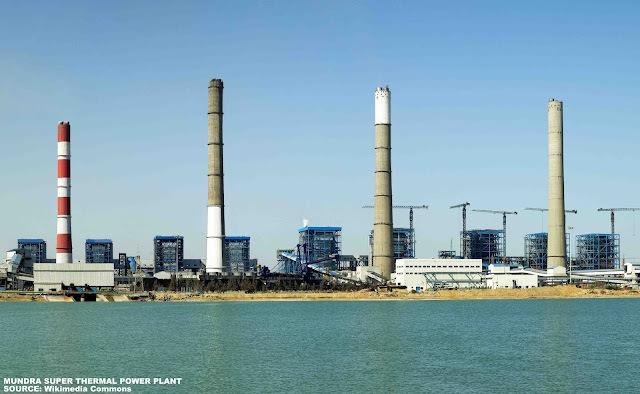 Additionally water usage by coal plants – which account for 95% of water usage in the energy sector – as well as the effects of climate change, threaten to add a dark lining to India’s bright energy future. Lastly the IEA estimates that India will need an annual investment of more than USD 100 billion from 2015-2040 to make this great transition, a challenge indeed, since between 2005-2014, the investment level has been just over USD 60 billion per annum.